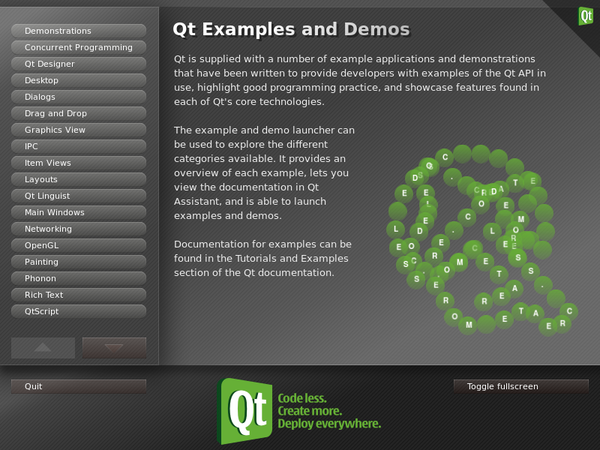 The Examples and Demos Launcher (qtdemo) allows the user to browse the examples and demonstrations included with Qt, access the documentation associated with each of them, and launch them as separate applications. The qtdemo executable should be installed alongside the other tools supplied with Qt. On Windows, click the Start button, open the Programs submenu, open the Qt 4 submenu, and click Examples and Demos. On Unix or Linux, you may find a qtdemo icon on the desktop background or in the desktop start menu under the Programming or Development submenus. You can launch this application from this icon. Alternatively, you can enter qtdemo in a terminal window. On Mac OS X, navigate to the /Developer/Applications/Qt directory in the Finder and double click on the qtdemo.app icon.